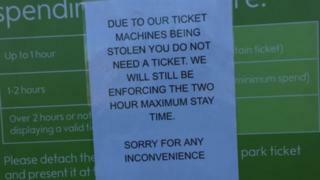 Thieves have made off with four ticket machines from a Waitrose car park. Police say cutting equipment was used to remove the machines from the car park of the supermarket on Mayor's Walk, Peterborough. It happened on 22 December, at about 19:45 GMT, when the store would still have been open and busy for pre-Christmas shopping. Branch manager Jon Ashley-Webb described the thefts as "frustrating" and "disappointing". Officers have not revealed how much money was taken in the raid. Mr Ashley-Webb added that although a two-hour parking limit would remain, customers would not have to provide a ticket until the machines were replaced. "Whoever did this would not have got away with much money, but the units are expensive to replace. It's very frustrating," he said. "We still have two working meters at the far end of the car park but I don't expect customers to walk all that distance to get a ticket." He said that although the car park was monitored and maintained by Waitrose, the ticket machines were the responsibility of a separate firm. Cambridgeshire Police revealed that an earlier, unsuccessful attempt had also been made to remove a parking ticket machine in Bridge Street in Peterborough in November.